Aki looks worried as we move off shore. We are canoeing on Mendenhall Lake. Rain stops as we approached the glacier. The sun, breaking through a sucker hole about a hand’s width above the Mt. 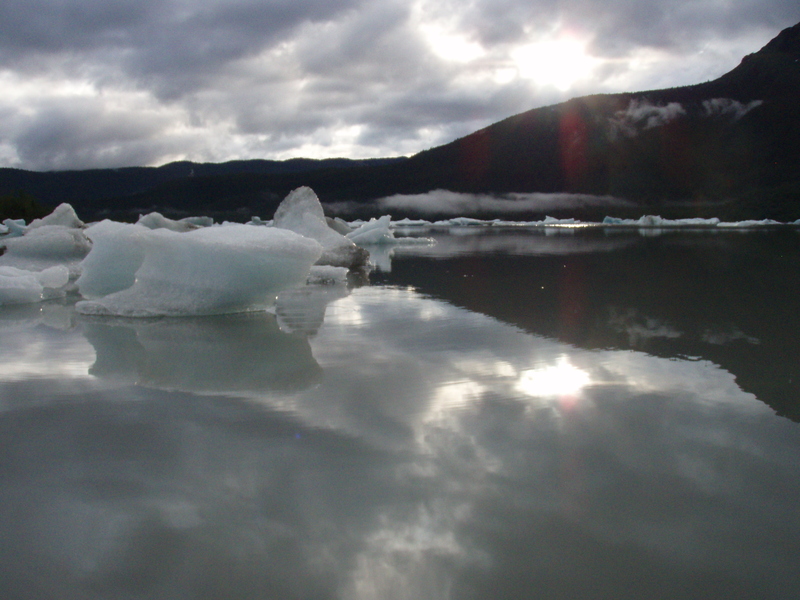 McGinnis shoulder, sends shafts of light on Mendenhall Lake and its new ice bergs. We have never seen so much ice on the lake. Using a canoe we weave thorough the bergs to get near enough to the glacier to see the new scars left by calving ice bergs. Each is a electric blue bruise with the darkest shades showing where deep cracks enter the glacier’s face. The sound of arctic terns is constant. Some of the ice bergs we pass have a single tern scout on them but most of the flock fly air cover over the wide sand islands where they nest. One tern hovers a few feet over us making clicking sounds rather than their usual scary screech. With no wind, our mottled gray sky mirrors on the lake water except where covered with floating ice. Without first seeing him, we surprise an adult merganser, forcing he and his family off their berg home. Watching them paddle away leaves a guilty pleasure. Later, we float without paddling up a stream blocked by a beaver dam. Again we disturb someone — this time a black bear on the other side of the pond who ambles calmly up a grass green slope until screened by spruce trees. 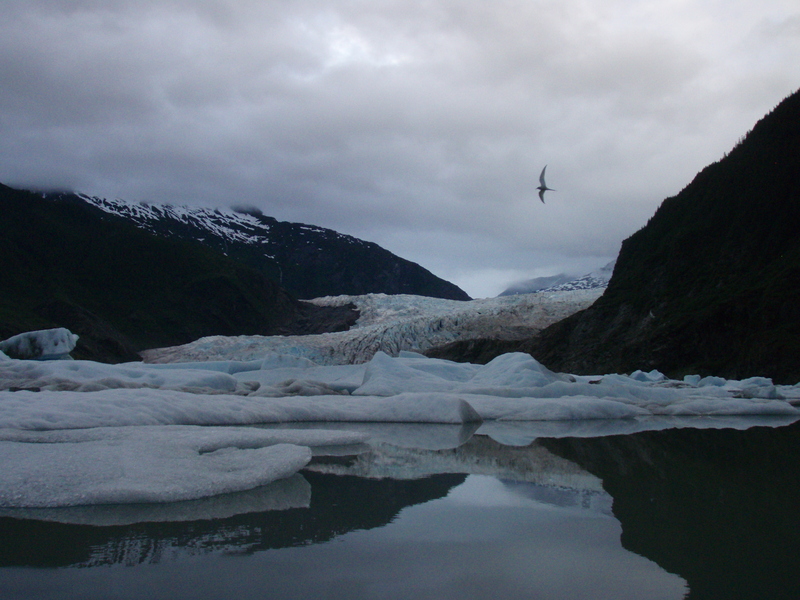 This entry was posted in Aki, Dan Branch, Juneau, Kwethluk, Nature, Southeast Alaska on June 29, 2011 by Dan Branch. They sit on a log staring at the river. He wears a bright yellow pullover that gives lie to the look of great sadness on his face. Her more subdued outfit better matches their mood. On this overcast day why do they concentrate on the river muddied with Herbert Glacier silt when they could admire the snow covered Chilkat Mountains across Favorite Channel? Perhaps they have accepted existentialism as their faith and expect the river and the outgoing tide to carry away their sadness. Aki starts to break toward them but stops when I turn and move deeper into the tidal meadow. We take this trail often and find it different each time. Today in the meadow, blue and the rarer white lupine flowers have reached their peak. Some are already forming seeds. Fire weed shoots are starting to muscle out a space for their magenta blossoms. In the woods, low growing sorrel cover open spaces with their simple white flowers, aided by orchid spikes and the blossoms of famine berries. 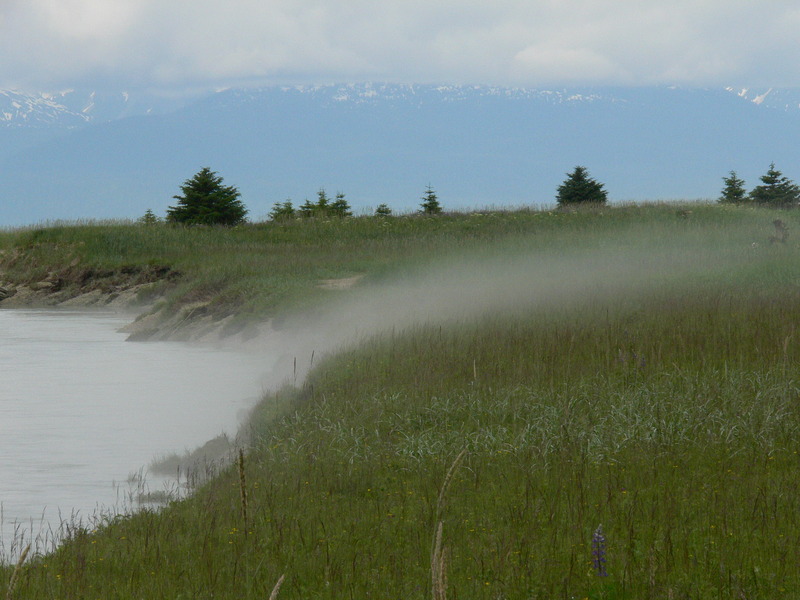 From the meadow, with the tide out we see great expanses of exposed sand bars and fine clouds of glacier silt curling like fog over the river bank to settle on meadow grass. I turn back to the couple on their seat of sadness just as a tendril of silty fog blows over them. This entry was posted in Aki, Dan Branch, Juneau, Kwethluk, Nature, Southeast Alaska on June 26, 2011 by Dan Branch. Each try for king salmon starts with a purchase of frozen herring, label blue. A bad choice could render meaningless hours of trolling for fish. Staring into the bait freezer I start to dig through the blues looking for the best bait. Without a king salmon to advise me it is really a matter of guess work so I drop all pretense of knowledge and grab two packs, pick out some solid tied hooks and check out. After loading and unmooring the boat we motor out into Favorite Passage, thankful that the predicted wind storm went some where else. I think of Aki and the look she gave me as I left, rod and lunch in hand, without her. She, with a dog’s famously short memory, will welcome me home this afternoon. Besides, she wouldn’t like the whacking sound the boat makes hitting wave tops and wakes or the crash of gear when we cross the particularly nasty wake of a deep hulled man hauler. The day is gray with a complex intersection of clouds reflected in a salt water sea colored with glacier silt. We welcome these days even with their promise of rain. Years of life in a rain forest have shown us how to find beauty in overcast. Perhaps this makes us like the English, able to admire Turner for his ability to find true beauty in the gray variation of each cloud and the way each wins a place for reflection in the sea. After putting out our lines we listen to a love song sung in French by a beautiful woman on the radio. Aki might like this but she is not here. Neither are the fish. We fish hard for hours without luck, trolling the edge of shoals of herring made nervous by charging chum salmon that occasionally leap into air while pursuing their prey. 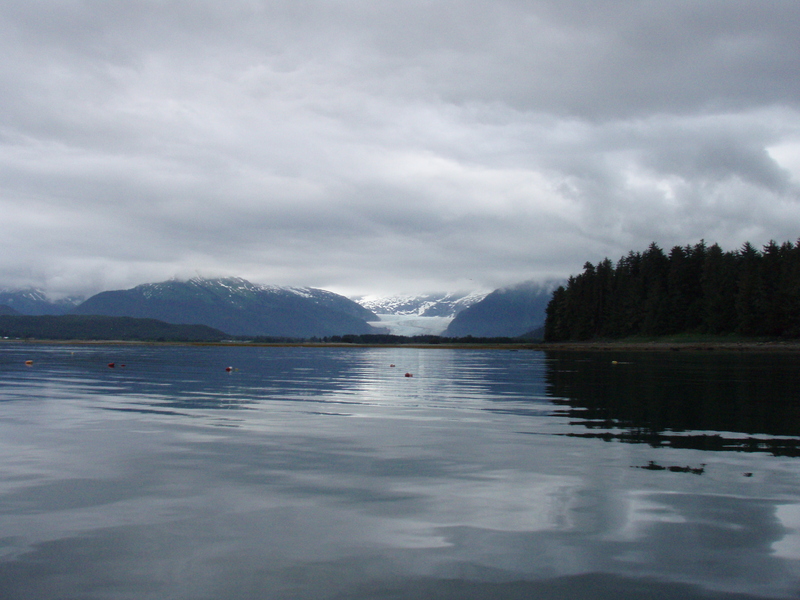 This entry was posted in Aki, Dan Branch, Juneau, Kwethluk, Nature, Southeast Alaska on June 25, 2011 by Dan Branch. Midsummer, hot, sunny and still only two or three families are using this beach. With the tide out, it forms a broad sloping border between sea and the spruce forest that has grown over the old Native village site. Aki chases her frisbee while we pass the canoe haul out ground. This space, now covered with flowering shrubs and berry brush once accommodated large ocean going canoes formed from huge red cedar logs. Fast and stable, they could carry subsistence harvesters, hunters, or warriors quickly to their goal. Canoes from here in 1794 scared Captain Vancouver’s men of the Royal Navy into a retreat to the back side of Admiralty Island. Today the beach is clean, swept by the solstice tide. Only Aki’s tracks and those of shore birds mar the canvas of sand. Small waves touch the beach in groups of threes and fives, giving a family of children an excuse to squeal. Moving on we head for a lunch on the Eagle Scout bench at Lena Point. Here the Princess Kathleen, on its way to Skagway sank in 1952. It was a beautiful, well maintained ship with a bow line dropping straight to sea and triple stacks amidships. Too bad it was poorly handled on the night it wrecked. Only a small buoy bag, attached by rope to the wreck, marks the Princess’ grave. 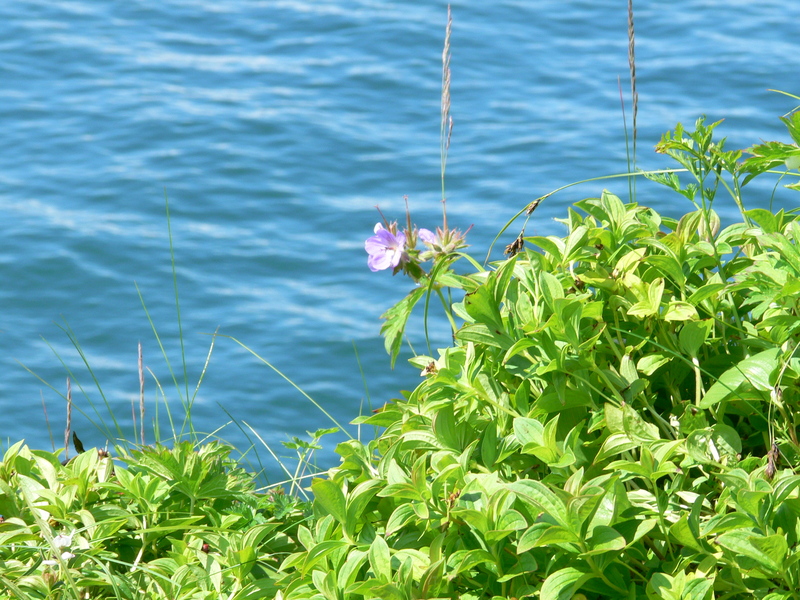 Wild geraniums, now showing translucent purple blue flowers line the cliff above the wreck as if left by mourners Over the site a school of salmon give away their location with multiple leaps into the air. On returning to sea from each jump they shatter the glistening calm of water at slack tide. From here we could have watched the Captain Vancouver’s long boat running for Admiralty Island. This entry was posted in Uncategorized on June 22, 2011 by Dan Branch. This morning’s good weather drew me out to the side yard for guitar practice where a cloud of song sparrows were waiting to jam. These guys are Bach fans. Halfway through Sleepers Awake the bird song vanished, replaced by the sound of a plastic garbage bag being dragged by a bear down Chicken Ridge. The black bear dragged its trashy breakfast to within a few feet from me then turned to settle into a spot across the street to eat. Living on the edge of true wilderness we practice good garbage practices to avoid creating trash addicted bears. The neighborhood failed this one. 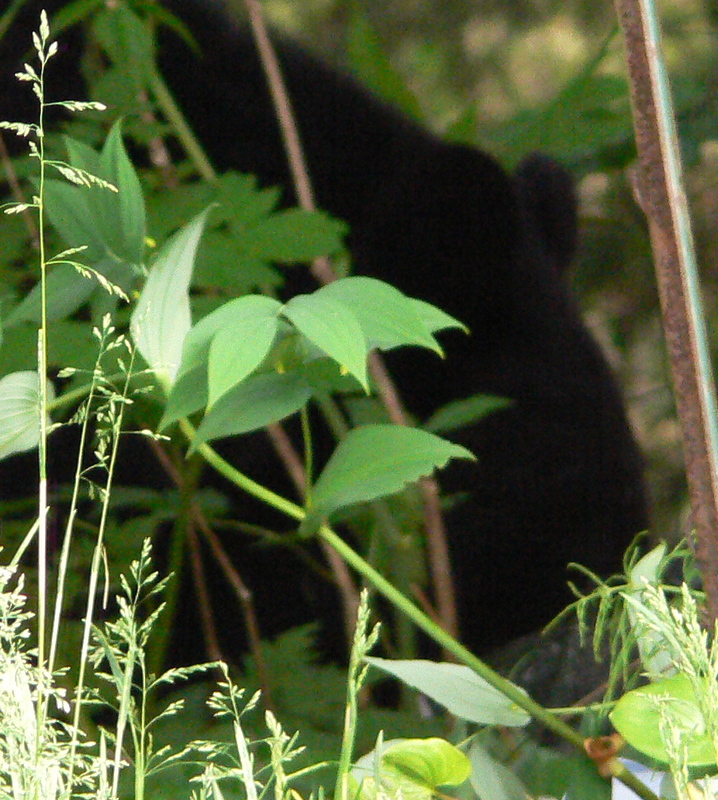 We also failed its cub which was waiting for mom to bring her someone’s cast away food. 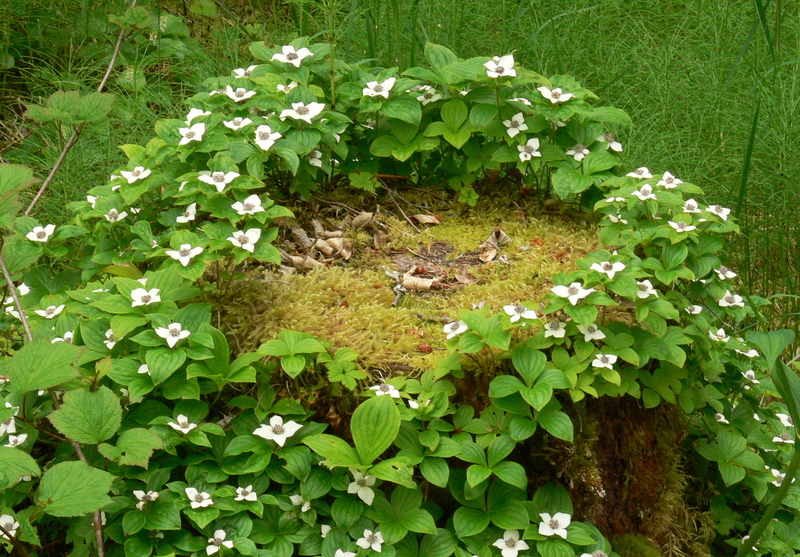 This entry was posted in Aki, Dan Branch, Juneau, Kwethluk, Nature, Southeast Alaska on June 21, 2011 by Dan Branch. I only have a few more years left of roaring twenties as I am roughly twenty-eight (if you subscribe to the clumsy 7:1 dog to human year of life ratio). As my thirties steadily approach, Edith Piaf blares in the background of my youth. Gone are the days of my people fashioning twine around my neck and stuffing me inside jackets and vests. Gone are the days of living without haircuts, without brushes and life before my hair turned grey with age. Yes dear reader, it’s true: all things must come to an end. Four years it’s been since they took me from that dirty, swampy pen of my youth. Four years it’s been since I was rescued from my fellow inmates; the yapping Maltese pup and that cruelly abusive albeit beautifully proportioned Miniature Pinscher we used to call Big Mike. Four years it’s been since I first set foot in this house, the place I now defend as my home. Looking back I realize how lucky I was. This doesn’t stop me from wondering if I could have had it better, though. 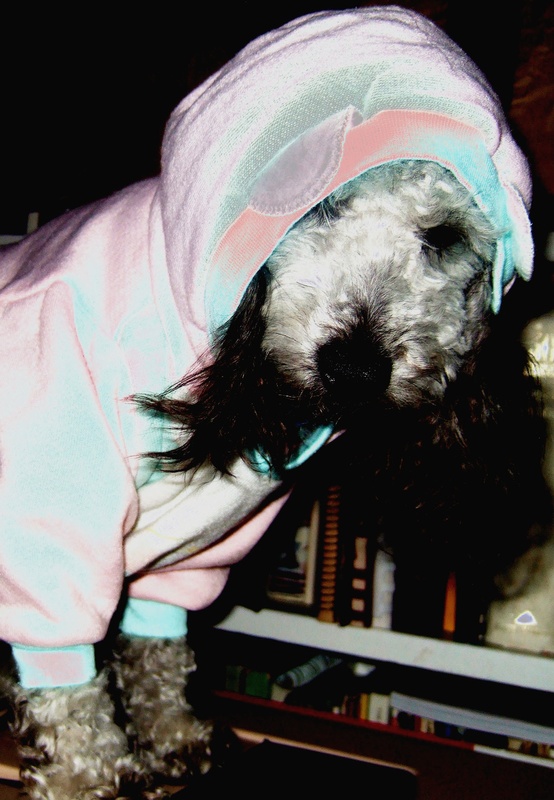 If I could have been liberated from the tall metal cages of my youth by humans with a better interior design sense, who carpeted their house with Sharp Cheddar and shelved sheets of milk bones in their lower bookcases. Perhaps even if this had been the case I would have wondered if there was something better still. This entry was posted in Uncategorized on June 19, 2011 by Dan Branch. Walking past the remnants of the bond fires built by underaged drinkers we leave the Camping Cove trail head and move into a lush alder forest. After passing down a steep dirt path lined with wet berry brush we follow wooden steps to the beach. The tide is out exposing great fields of blue mussel colonies to the Paynes Grey color sky. The Juneau gill net fleet idles off shore waiting for the Sockeye Salmon commercial opening. It comes in an hour. 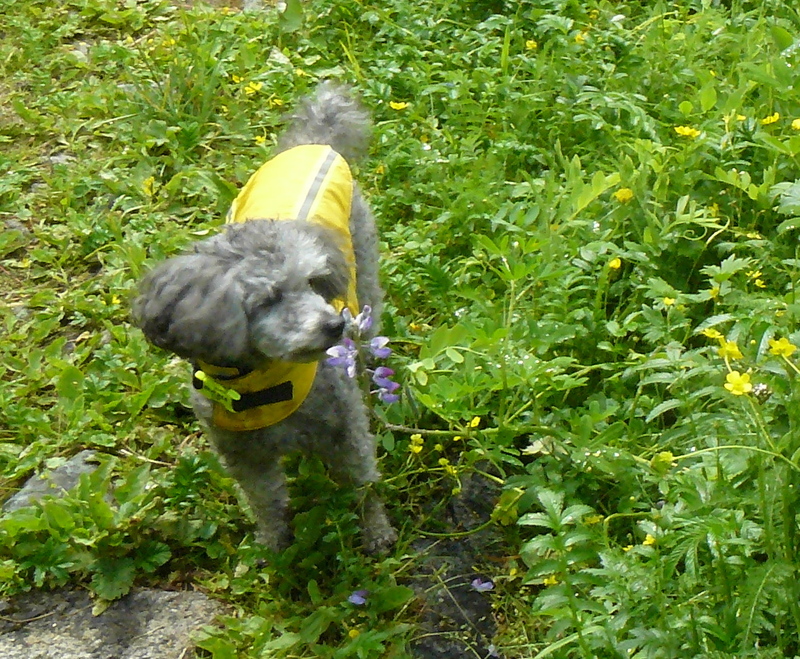 Aki appears to sniff a Lupine blossom as I apply mosquito repellant. Fool me once shame on you bugs but fool me twice, shame on me. Yesterday the shame was on you. We passed through here last on a hard winter’s day with enough snow on the ground to show animal tracks. Today sandy mud exposed by the tide reveals the crisp tracks of a deer so small it must still have fawn spots. I look up wondering if we can find her at tree line, breathing hard but find only a Horary Marmot watching us from a rocky headland. He’s a cool customer, apparently reluctant to reveal his position by giving out the shrill warning cry of his kind. Aki is too low to see his fluffy body fur and long tail moving along the high tide line before breaking into the woods. Taking advantage of ground exposed by the minus tide we stay outside of the woods and work around a couple of headlands toward the next pocket beach north. An eagle calls out as its mate approaches without anything in his talons. I fancy she is scolding him for wasting time watching baseball at the Imperial Bar while she is stuck at home listening to demands of their hungary chicks. He answers as a supplicant but I know things won’t go well for him when he hits the nest. Two whales break the surface nearby but a rock outcropping blocks them from view and I can only listen to them exhaling. Then the gill netters fire up their diesel engines and head out into Lynn Canal. Just before returning to the forest for the return trip we watch one of the fishing boats make a set by releasing its deep net to form a long straight wall in the sockeye’s path. A young deck hand cheers as the first salmon hit the net, making its floats dance. Soon another season’s promise will be in the gillnetter’s hold.